The Biological Opinion was the outcome of a consultation process that began in the late 1990’s after three fish species were listed by the National Marine Fisheries Service (NMFS) as being threatened under the Endangered Species Act. Afterwards they initiated a consultation process with the Army Corps of Engineers (ACOE) and Sonoma County Water Agency (SCWA). The purpose of this consultation was to examine ways that reservoirs, dams, and river operations, implemented to serve Water Agency customers, were affecting threatened species (Steelhead trout, Coho & Chinook salmon). After consultants conducted numerous studies, in 2007 SCWA provided a Biological Assessment to NMFS describing the ways agency facilities had been affecting the fish. After about a year, NMFS issued a Biological Opinion (Sept. 24, 2008) in response, containing almost 400 pages of findings and project requirements to be completed by SCWA within fifteen years. There were many elements covered, but RRWPC has focused on the requirement to lower flows and the Estuary Management Project. 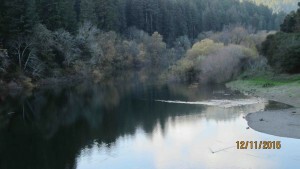 Regarding the Fish Flow Project, as intent to permanently lower summer flows has come to be known, RRWPC has focused on the lower river, since we believe that most of our water comes from Lake Sonoma and the free flowing tributaries downstream of Dry Creek confluence that contributes greatly to our supply. Gradually, over the years, diversions from the Eel River have become greatly diminished for reasons that are highly complicated. Upper river users will be strongly affected by this diminished supply. RRWPC has been very involved in the Estuary Project as well. There is a great deal of information in the section, Estuary Project: Biological Opinion, dedicated to this issue and is one that RRWPC litigated. A Settlement Agreement was signed September 7, 2012.